This year the city of Saratoga Springs is celebrating its centennial. So is its most noted statue: The Spirit of Life in Congress Park. The sculptor, Daniel Chester French, is well known. But French's model for the Spirit of Life -- Audrey Munson, and the tragic story of her rise and fall -- have nearly disappeared into history. 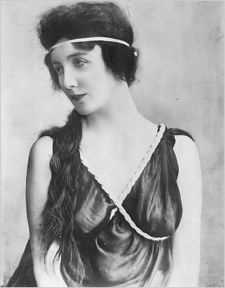 Audrey Munson was born in Rochester in 1891. After her parents divorced, she moved with her mother to New York City where she was introduced to a sculptor and her modeling career began. Success followed not long after. She was the model for the Mercury dime and half dollar. Sculptures bearing her likeness were displayed so often in New York City that she was nicknamed "Miss Manhattan." 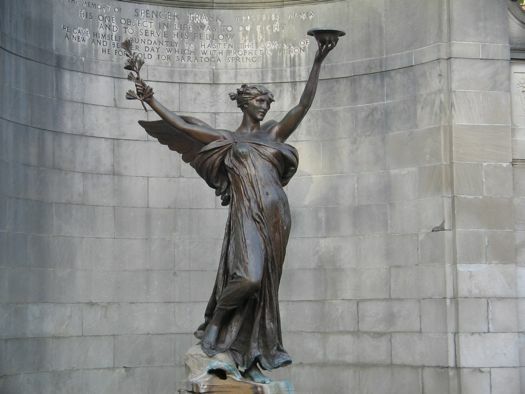 Eventually she attracted the attention of sculptor Daniel Chester French, who used her as a model for The Spirit of Life (and at least nine other works). The Saratoga Springs sculpture ranks with the Lincoln Memorial as some of French's best work. Munson was more than a set of classic Greek features, though. She wrote a series of articles in the 1920s for The New York American in which she challenged the prevailing standards for beauty: "All girls cannot be perfect 36s, with bodies of mystic warmth and plastic marble effect, colored with rose and a dash of flame ... Of course not." An ad for Munson's second film. Eventually Audrey Munson made her way back to New York City, and moved into a boarding house owned by a doctor. The doctor fell in love with her -- and then murdered his wife so he could be with Munson. Audrey and her mother had left the city for Canada before the murder took place. There was a nationwide manhunt for her. She was questioned, but never implicated, in the murder. The scandal proved too much, however -- her career was ruined. Munson returned to the United States and settled in Mexico, New York in Oswego County. It sounds like it was a difficult time in her life. For a while she sold kitchen utensils door-to-door. And in 1922, at the age of 31, she tried to kill herself. As the New York Times reported then: "It became known today that since the announcement of her engagement to Mr. Stevenson, Miss Munson has been calling herself Baroness Audrey Meri Munson-Monson, though the derivation of the title is as much a mystery as her effort to commit suicide." A Times search for the fiance came up empty. In 1931, Munson was committed to an asylum that would come to be called the St. Lawrence State Hospital, suffering from what was believed to be depression, schizophrenia, and paranoia. She would live in the institution for another 65 years. Audrey Munson died in 1996. She was 104. To this day her likeness is still seen daily by millions in New York City in multiple locations: atop the Manhattan Municipal Building, as "The Spirit of Commerce" at the foot of the Manhattan Bridge, as the gold figure overlooking the the USS Maine Monument in Central Park, looking down upon the Pulitzer Fountain (where her bare behind was apparently too much for Alice Vanderbilt), and elsewhere. And, of course, she keeps watch over her corner of Congress Park in Saratoga Springs as The Spirit of Life, a restoration of which will be unveiled later this year. I was just reading about Audrey recently. The number of works she posted for is just incredible, though her life was quite sad. I've always loved that fountain ever since the first time I saw it in Congress Park when I was about four. It didn't matter then who sculpted it or what it represented, I just thought it was beautiful. Heartbreaking. Thank you for this article. Generally when someone lives to 104 it's viewed as some kind of human victory. In this case 65 years in an insane asylum is just tragic. I'm also struck by the change in standards of female beauty from 100 years ago. Now her smooth pear-shaped body would not be considered "buff" or toned enough for the red carpet or cover of Sports Illustrated swimsuit issue. She'd be told to hit the gym and maybe even consult a plastic surgeon for some enhancement. This is a nice reminder of what natural beauty looks like. Audrey Munson must be honored with a postage stamp, and I won't accept anything less for America's greatest model. Over 20 years ago (when Munson, as I suspected, was still alive), I rediscovered her and presented my papers to the Manhattan Borough Historian. I also presented my papers on the origin of "the Big Apple," a term popularized by track writer John J. Fitz Gerald, who was born in Saratoga. No one in NYC would help me, or even talk to me, on either Miss Munson or the Big Apple. I left NYC and now live in Goshen, NY--where an undiscovered Audrey Munson work can be found in the Everett Memorial Fountain. San Francisco is now celebrating the 100th anniversary of 1915's Panama-Pacific International Exposition, yet Miss Munson--the PPIE Girl--is not being honored anywhere. It's a disgrace. Here's what you do. Anyone and everyone, write to the mayor of Saratoga and ask for support for an Audrey Munson postage stamp. Get the mayor to send letters to the mayor of San Francisco and to Rep. Nancy Pelosi asking for San Francisco's support for its PPIE Girl. This would cost almost no money and very little time. These powerful people should kindly ask the U.S. Postal Service where the heck is the Audrey Munson stamp--something I'd suggested many years ago. America's greatest model (who is good enough to be on U.S. coins) deserves to have her own stamp, and it can all start in Saratoga. Then, The Spirit of Life should be properly re-dedicated. Thank you so much for this article, I really appreciate this a lot. Audrey is my second cousin once removed and have always been in love with her story. I have done quite a lot of research of my own about her as well as my mother. Thanks again and I really appreciate this article. Saratoga could be the first to honor her. It would simple to do and not a huge expense- put up a small bronze plaque at the monument naming her as the model.